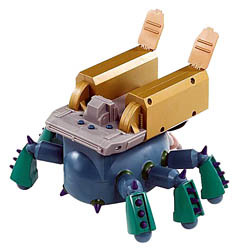 Yu-Gi-Oh Launcher spider has unique battle features thatlet kids play just like their favorite characters from the TV show. The Launcher Spider has an infrared control with two attack speeds, search and attack. There is a search beacon and the Launcher Spider also fires missiles to destroy monsters and help kids become the King Of Games.